He may have missed the football game that he was so keen to get out of here to see earlier, but 54-year-old Portuguese native Antonio Matias must be taking at least some consolation in the fact that he has beaten an extraordinary 322-strong, pro-spattered field to take the inaugural Portuguese EPT title. He came into the final day as huge chip leader, and although he did find himself out of the top spot a couple of times, he got it all back in the end to pick up an incredible payday, as well as the coveted EPT title and trophy. Seldom playing live poker, and even more rarely playing tournaments, the travel agency director felt that he couldn't miss the first EPT in his home country and bought in for fun - but was clearly taking it very seriously, and it was a thoroughly well-deserved win. Many congratulations to Mr. Matias, and, indeed, all the final tablists. As players and railers alike start to trickle out of the Casino Vilamoura and into the many and various drinking and leisure establishments of the town, all that's left to say is a resounding goodbye from all at PokerNews, PokerStars and the Casino Vilamoura. From the PokerNews team out here in Portugal, it's over and out. 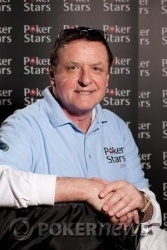 Pierre Neuville opened to 240,000 on the first hand back from break. Antonio Matias called, and they went off to an action flop. It came , and Matias checked. When Neuville continued out with a bet of 315,000, Matias stuck in a check-raise to 815,000. After just a moment, Neuville announced that he was all in, and Matias instantly called. With the tournament title hanging in the balance, the cards were turned up. The crowd pressed in around the table, elbowing for a sight line to catch what would be the final board cards of the day. Neuville needed some help to stay afloat, but the turn was a disastrous . Matias and his posse were already in celebration mode as the dealer filled out the board with a useless . For Pierre Neuville, it was a remarkable effort that fell just one spot short. He gave it a fine run, but it was clear nobody was going to beat Antoino Matias on this day. For his work this week, Neuville will pocket €257,681. We're back, and so are the final two players. Let's settle this. We are still heads up, and it's time for a break. Pierre Neuville raised to 165,000 to open the action, and Antonio Matias came along with a call from the big blind. The first three cards off the deck were , and Matias tapped the table. Neuville continued out with a bet of 200,000. After just a quick pause, Matias made the call, and both players would check the on the turn. 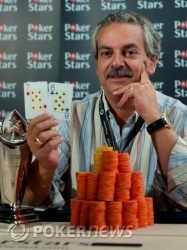 The river was the , and Matias led out into the pot for 375,000. That was good enough; Neuville laid it down, and the pot goes to Matias. Our two heads-up-onauts limp/checked their way to the turn of a board before we saw any action. Neuville bet out 75,000, to which Matias responded by raising to 250,000. Neuville thought about it for a few moments, and then reraised to 750,000. Everyone at the rail stood up, and various media personnel swarmed in around the table. Matias just flat-called, though, and both players checked the river. Neuville turned over for a flopped two pair, queens and fours, which had turned into a different two pair, queens and sixes, by the river. Nevertheless, it was good enough to beat Matias, who just mucked. Matias raised his button to 255,000, and Neuville passed. Next hand, Neuville raised to 180,000 - but Matias made it 500,000, and Neuville gave it up.